French filmmaker Jacques Tati quietly booked his place amongst the pantheon of film comedy’s legendary figures with a small but exquisitely conceived body of work. In astutely re-interpreting some of comedy’s oldest and purest techniques, filtering them through a distinctly modernist framework, Tati became an influential guiding light for the generations of comedians and filmmakers that followed. Tati developed his comic intentions in the early part of his career as a performer in the French Music-Hall. Supplying the customary apprenticeship in the essentials of comedy, it would also prove to be the point of departure for an ambitious Tati to spread his wings, eventually transferring his stage qualities to film, in 1948 he directed and starred in Jour De Fete, his first feature film. As François, the over-worked and irritated postman of a peaceful rural village, Tati began his cinematic formulation of physical comedy with an extended finale sequence reminiscent of a Charlie Chaplin or Buster Keaton set-piece, featuring Francois tearing around on an antiquated bicycle in a torturous effort to complete his rounds, and avoid the myriad perils of the countryside. Humour derived from the awkwardness of Tati’s own physique (he was very tall and lanky) quickly established itself as a major pre-occupation in his work, receiving further attention, on a more universal level, in his later films. Tati introduced his most enduring character, the near-silent and bumbling Monsieur Hulot in 1953 with Monsieur Hulot’s Holiday, perhaps the best loved and most accessible of all his films. Donning his comical hat and arching his pipe inquisitively, Hulot leaves the city for a spell in the sun, ruffling the feathers of the Parisian holidaymakers and causing untold devastation along the way. Tati’s unfussy plot decisions simply constructed the necessary unfamiliar environment within which Hulot could be best placed to act as the comedy stooge in relation to the strangeness that surrounded him. Tati understood that great comedy, and great comedy moments, are created out of difference and alienation. The “fish out of water” formula employed in Monsieur Hulot’s Holiday ensured the necessary sparks of conflict and tension that could then be released in a number of hilarious pay-off scenes. With each film that followed the ambition and complexity of Tati’s comedic style grew. He committed himself fully to a rigid filmmaking approach that became increasingly apparent onscreen. Tati pioneered a comedic process that relied almost exclusively on visual elements infused with ambient sound; dialogue was almost entirely abandoned as a means to convey humour. Presented in an often uniform and unobtrusive fashion with the camera doing very little work at all, Tati’s subsequent feature films appear as little more than a collection of frieze-like sketches strung together for cheap laughs. However, this surface simplicity belies a complex, multi-layered process of preparation and choreography that Tati stuck to meticulously. An encroaching satirical edge, until now largely dormant, soon manifested itself much more clearly in Tati’s work. Themes of alienation and disenfranchisement soon found specific targets as Tati launched his attack on the complications of contemporary French society, publicly citing particular grievances with the self-automated blandness of modern homes and workplaces. Mon Oncle (1958) features Hulot in his own, disappearing natural habitat: suburban Paris. Hulot makes his rickety home above the local shop in a sleepy enclave of traditional “Frenchness”, complete with rustic market stalls and cobbled, hand-swept streets. Tentative trips to the other side of town leave Hulot baffled by his relatives’ modernist shrine, where every gadget and convenience simply compounds his confusion. Hulot is presented as an anachronism, ill at ease in a changing environment; puzzled by modern devices and customs and unable to function or interact successfully with individuals (such as his sister and her husband) eager to embrace the new technology. Tati managed to wrap a charming story concerning the relationship between Hulot and his cheeky nephew around his more serious social pre-occupations. Emerging nine years later in 1967, Tati’s masterpiece of cerebral comedy: Playtime drew together all of his ideological concerns in one tightly packed visual canvas. Shot on 70mm film stock and featuring bold set and sound design, every scene in Playtime is a cascade of visual comedy effects, going off like fireworks one after the other, producing an overwhelming sensory assault that is, at times, physically hard to take in. Tati maintains his customary distance, never resorting to the tight close-up but preferring to expose Hulot’s everyman figure as isolated and insignificant amidst the imposing uniformity of his surroundings. Hulot is a passenger ambling through a fully modernised Paris of sleek glass and steel office towers, now transformed to resemble every other major city in the world, as depicted in numerous tourism posters. The city’s treasured monuments are but a fading memory, seemingly incongruous with the new ethos of cold conformity. The Eiffel Tower, the Arc De Triomphe and numerous other icons of antiquated French culture are spotted in reflections as people pass through the clear glass doors, as constant reminder of what has passed. In order to facilitate his vision for Playtime, Tati had an entire scale-city built on the outskirts of Paris. Dubbed “Tativille” it featured moveable, cut-down models of skyscrapers that could be positioned accordingly and large ground-level street sets custom-made to suit the directors’ pre-planned intentions. Tati built sets to represent a notion of modern day Paris, it seems ironic that Jean-Luc Godard’s sci-fi noir thriller Alphaville, filmed two years before, was shot on location in the French capital, despite the events of the film taking place some time in the future. Grandly designed and curiously executed, Playtime is a uniquely conceived piece of cinema. 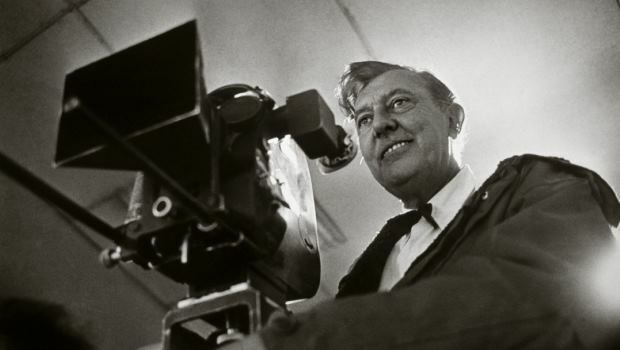 Jacques Tati once said famously that he endeavoured to produce films that would make people smile. On reflection, his body of work proves that he went much further; subtly encouraging people to observe more intently and to think more astutely about social concerns through a gentle form of humour. Those concerns may seem a little less relevant today, but the films lose none of their potency or charm as a consequence.